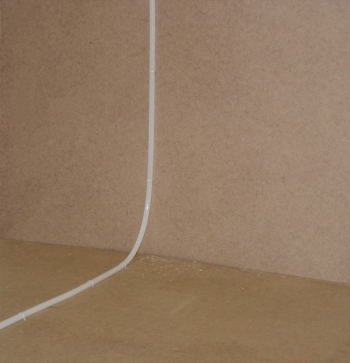 The material of ZIMENT® wall-heating system is polyethylene with increased resistance to heat, the heat technical and its mechanical characteristics fully comply with the requirements (DIN 16833). The diameters of ZIMENT® pipes are 10x1.3; 12x1.5; 18x2; 20x2 mm. 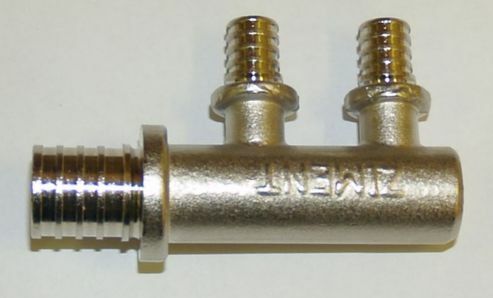 an example for the placement of a heat-transferring pipe with one small distributor. The plastic heating pipes of ZIMENT® wall heating system have protection against oxygen diffusion and comply with the requirements of DIN 4726. 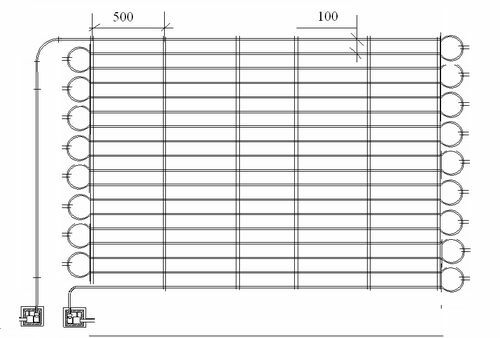 The outside diameter of ZIMENT® main pipeline are 18x2 mm. 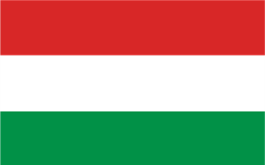 This pipeline connects the large and small distributors-collectors. The heating coil is mostly placed on the inside surface of the outside wall but it can also be placed on the ceiling, which will provide heat transfer, its size is 10x1.3 mm. Large distributors-collectors are usually placed on each level, but can be fixed somewhere off the wall or inside it, in built-in cabinets. Controlling is done here, which it may be either manual or automatic. Individual control of each circle is provided by these large distributors. The small distributors-collectors are placed in small plastic cases carved into the wall. The plastic case is coated with plaster so it can be found easily. 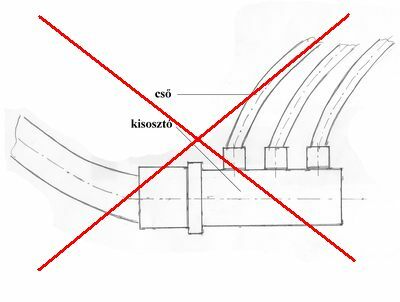 It is important that it is FORBIDDEN to assemble the small distributors-collectors into the subconcrete! 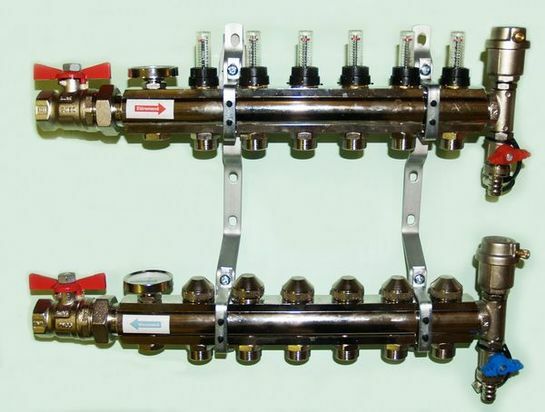 The heat-transferring pipeline is connected to the heating/cooling main pipeline using compression connection type and small distributors. First a clamping ring is placed manually on the pipe – it is rather easy to do – then the end of the pipe is cut to size and expanded to the required size by easily pushing it onto the stub of the small distributor. At the same time, when putting on the end of the pipe take care of the O-ring placed on the stub to remain in its place, as this would provide for safe tightness later. Then press the clamping ring on the stub of the small distributor using a handtool. Perform the above procedure on all stubs of the small distributor-collector. 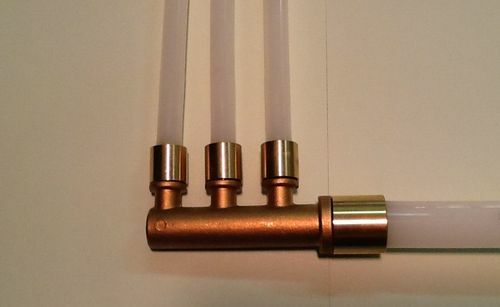 The length of the circuits (heat-transferring pipe) starting from the same small distributor should always be identical. On a small distributor of 3 stubs, all 3 circuits must be equal in length. If, for example, the first circuit is 31 m long, the length of the other two circuits must be 30 m. A small degree of tolerance is yet allowable between the circuits of one small distributor, that is 0.5 m. This is necessary as there is no controlling at the small distributors, and the hydraulic resistance of the circuits of the same small distributor must be equal. 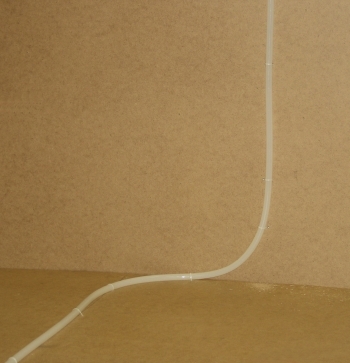 The length of a circuit made up of the pipe Ø10x1.3 mm may be maximum 30 m. If several circuits are assembled in the same room, try to roll up the pipes parallel and horizontal, as it provides for the equal length of several pipes and quick deaeration. Small distributors with 1-2-3 stubs may be applied, which cover the following surfaces in case of 30 m-long circuits: 3- 6 - 9-m². The diameters of the main pipeline connecting the small distributors and the large distributors are usually 18 x 2 mm, the length varies between 10 and 15 m, but usually doubled for the flow and return lines. Pipes Ø12x1.5mm are also applicable as heat-transfer pipes. In this case there is no need to use small distributors, the circuit starts directly from and returns to the large distributor. The length of a circuit is maximum 50 m, including the pipe from the heat-transferring wall section to the distributor. The product offer also includes Ø 14 x 2 mm wall-heating pipes, the length of a circuit of which may even be 60-70 m. Its application is identical to that mentioned for pipe Ø 12. An example for use: The client does not want to have small distributors fixed onto the wall, thinking that the connectors are possible sources of faults. In this case we can suggest, depending on the size of the necessary heating surface (in m2), the pipes with higher diameters which can be assembled without connecting or lengthening and will start from and return to the distributor. In case of thick pipes the plastering of the ceiling is complicated, so in any case, Ø10x1.3 mm pipes are recommended. 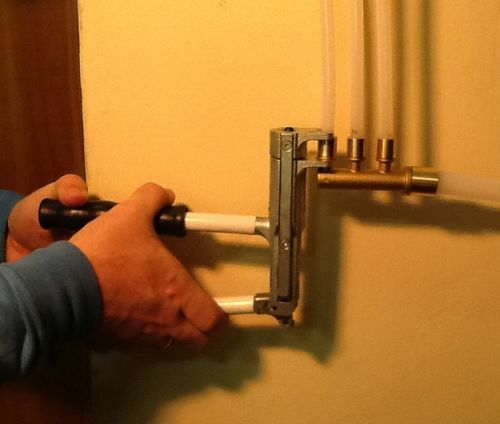 For this wet technology the pipes should be assembled by clamping them into the rails fastened on the wall. In case of piped walls, a dryvit net (glass-fibre mesh) should be placed into the fresh rough coat of plaster that runs over the pipes by 20 cm. After the rough plaster is hardened floating is performed using a traditional method. Pipes should be bent by curves at least ten times the radiation of the diameter of the pipe. For floor-heating the use of pipes size Ø20x2 mm is widespread, these pipes may be laid in a length of maximum 100-120 m. Also pipes size Ø18x2 mm may be used, this is reasonable in several cases in order to save material, since the main pipeline is also made up of this type for wall-heating, therefore, less waste is generated. These may be laid in a length of maximum 80-100 m.
Pipe size Ø17x2 mm is rarely used, this size may be useful if the subconcrete is not thick enough. These may be laid in a length of maximum 70-90 m.
These sizes may be assembled using traditional snapping ring connections, and are connected directly to the large distributor. After finishing the assembly, the system should be put under pressure and have a manometer on the distributor, in the place of the automatic deaerator. Special care should be taken not to damage the plastic pipes during assembly. When storing the pipes and fittings special attention should be paid to conservation. Pipes and parts should be protected from sharp objects and throwing. First step – put the clamping ring on the pipe. Then expand the end of the pipe so that it can easily be pushed onto the stub of the small distributor. Push the pipe to its place. Perform this procedure for pipes Ø10x1.3 mm and pipelines Ø18x2 mm. 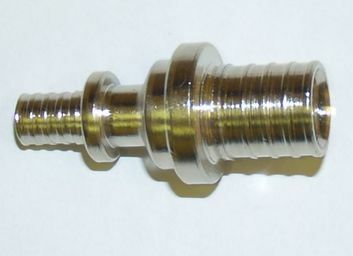 Press this end of the pipeline onto the small distributor, while the other end is fixed to the to the eurotaper connection of the large distributor. During pressing take care of the ring to be pushed on the stub of the small distributor straight. 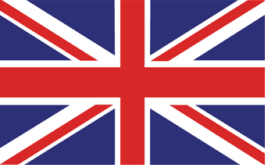 It is forbidden to press the ring on the small distributor stub if it is askew! 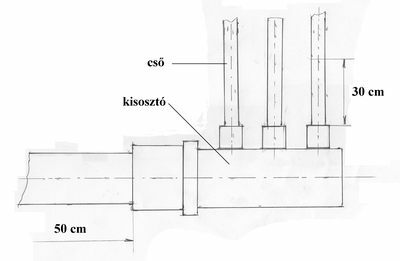 Further care is required when the pipe is placed into the small distributor so that it becomes uniaxial with the stub, at least twenty times the length of the diameter. 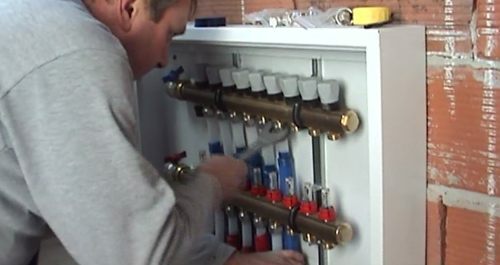 The pipe must not be put connected to the small distributor this way! Please note again that the whole system should be subject to a pressure test after assembly. This has to be done in every case.